Otara also hosts the only the only Pacific farmers/flea market every Saturday morning. After being in Auckland for 2 years, it was about time for me to do an immersion course in the daily life of Polynesian culture. For baptism by fire, there is the annual (and claustrophobic) Pasifika Festival which takes place at Western Springs every March. The periphery of the market is the farmers’ stalls with their colourful displays of the freshest fruit, vegetables and herbs in inviting, overflowing piles. I saw some Asian vegetables that I hadn’t seen elsewhere, – fresh bamboo shoots anyone? These were small though, and likely to be more hassle than they are worth to prepare, but fresh bamboo shoots are a taste sensation. There were also fresh turmeric and lemongrass, and mountains of crimson chillies. The fresh produce here is cheap and the quality is second to none. There are several Pacific grocers, takeaways and bakeries in the buildings flanking the market, and it’s a wonderland of sorts browsing through the offerings. I felt like I was in a different country, staring at the pink and white taros of gigantic proportions and the colourful labels of the dozens of brands of canned mackerel and tuna. The Polynesian takeaways sold delicious deep-fried dough (panikeke), with their crunchy exterior and soft chewy centres, and variations such as German bread (panikeke with sweet coconut filling). I wasn’t brave enough to order the pigs head, but I did try some palusami (boiled taro leaves in coconut cream) and boiled taro and banana. 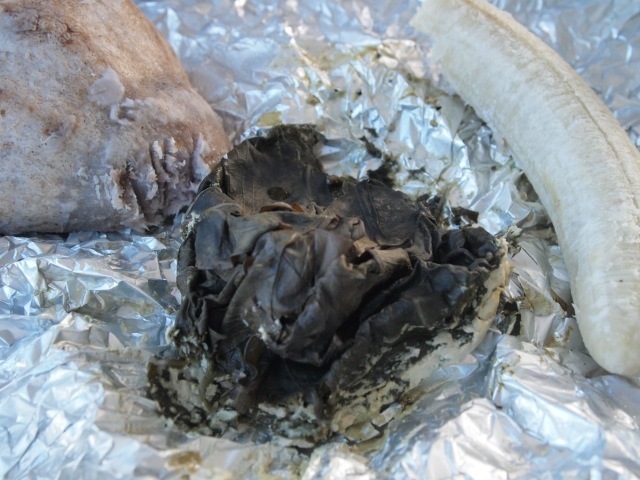 The palusami went well with taro, but the boiled banana tasted like crunchy cardboard. It was a fascinating way to spend a morning and I look forward to making a return trip, and one of these days, I might even have a go at the pigs head! I didn't know the numbers, but yes, Auckland is the biggest Polynesian city in the World :-). btw, I am learning hot hula! I've been buying fresh bamboo shoots at the Avondale market, where they had different types for sale at different prices. Not too sure how to choose them though. I was picking the giant ones so that there would be more left after you remove the outer leaves, but some Chinese lady asked why I was doing that, and suggested I should be going for the smaller ones (perhaps they are more tender?). I've learnt quite a bit as well, I didn't realise the predominant culture is Samoan. That's really interesting. I haven't tried these, as I used to prepare them for mum which took ages (I was her sous chef when I visited), and I can't quite get motivated to do this at my own home. She used to just pick the large sized ones. Now, I'm really tempted to just get some and try it out. I have never seen fresh bamboo shoots for sale in NZ. Glad to see they exist there and also at Avondale Markets. I tried a taro leaf dish once, but it made my tongue itch. I wasn't sure if it was because it wasn't cooked enough or because I was reacting to it. I love taro though. It's not used nearly enough in New Zealand. It really should be more common than it is. How was the pig's head cooked? I think I would give it a try. Genie, I agree about the taro. It was actually really tasty. Taro is used in Malaysian cooking, often in savoury dishes with meat, and sometimes in desserts. the pigs heads looked like they were cooked in a oven, maybe umu-style? They look quite intact and the skin is well-browned.